Newly remodeled studio with charming Western elegance and comfort. This cozy condo was completely remodeled in September 2012. It is located one level down from the upper parking lot, making it easy to load/unload. E3 is in the PERFECT location as it's on the same level as the office, recreation room, picnic/deck area and grill with just a few steps up to the hot tub. Ski on or off the main deck just down the hall from your room with no stairs in those clunky ski boots. There are plenty of drawers with a storage area for empty luggage in the loft and ski/board racks to keep things out of the way for more living area. 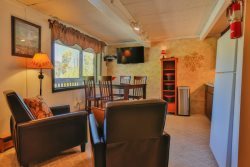 If you like a little peace and quiet, E3 is just far enough away from the recreation room and outdoor hot tub. And even better, nobody is above you except a skylight to enjoy the stars at night. From the condo you can enjoy a beautiful view of the Sunlight Mountain Resort, the Roaring Fork Valley, and the White River National Forest. 50% deposit minimum of lodging cost total per condo due at time of reservation. Full payment or remaining balance for reservation due at or before arrival.